Vibravoid - Doris Delay 7"
This is the second 7" release by Vibravoid and their sixth release in total since 2001. The play a very cool mix of Pink Floyd inspired psychedelia-pop-freakout rock! 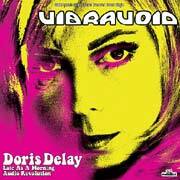 Doris Delay is a great song with phased out wah guitar and a very Syd Barrett inspired chorus. The B-side is two electronic pieces. Late As A Morning is a slow building soundscape with a buzzy synth that pans back and forth. Audio Revolution (Volume 2) is based on a repetitive piano like synth line. These tracks are only mildly interesting compared to the excellent title track. The 7" is released on black and a whitish-beige vinyl.